For 28 years I have worked with individuals who are retired or who are fast approaching their retirement years. The concerns for most are often the same. How will there retirement years be affected by health care, long term care, monthly income, or possibly running out of money. While these are concerns of all retirees across this great country they are also concerns of retired veterans who served our country when asked to defend her. 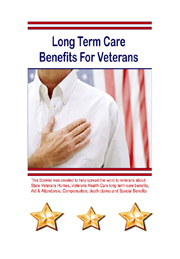 For many retired veterans they maybe unaware of benefits specifically available to them or their surviving spouse providing some help for the above mentioned concerns.